We love Easter time! It is a few days to spend time with your family and friends, hunt for chocolate and make the most of everything rabbit related in the shops! It really is the cutest holiday of the year! 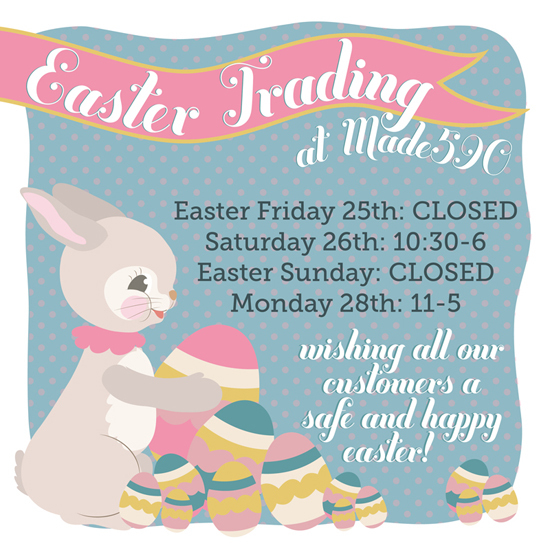 Our trading hours are slightly different this weekend. But don’t be sad, because our online store’s doors are always wide open, you don’t even have to get out of bed to shop at made590 if you don’t want to! We hope you all have a wonderful and safe Easter weekend – we will be making ourselves sick on chocolate and hot cross buns! Previous Previous post: New Style – Gladys Dress Instore and Online Now! Next Next post: New Style Instore and Online now – Vicky Top!